“Days of Our Lives” spoilers for Monday, February 11, tease that Jordan Ridgeway (Chrishell Hartley) will urge Ben Weston (Robert Scott Wilson) to accept that he’s dangerous. She won’t think it’s right for Ben to be running around town posing a threat to Salem. Jordan will insist that the only way to keep everyone safe is to check himself back into Bayview. Ben will understand why Jordan would have concerns, but he’ll assure his sis that he’s OK now. He missed a dose or two of his meds, but he’s back on track. Ben will promise that he has no intention of hurting anyone, especially not Ciara Brady (Victoria Konefal). Of course, Jordan won’t care about her brother’s intentions. She’ll maintain that Ben could spiral out of control at any moment. Days Of Our Lives Spoilers – Will Jack Betray JJ? While these “Days” siblings spar over Ben’s mental state, Jack Deveraux (Matthew Ashford) and Eve Donovan (Kassie DePaiva) will have an argument of their own. DOOL fans know that JJ Deveraux (Casey Moss) confided in his father. He revealed Haley Chen’s (Thia Megia) big secret, but Jack accidentally let a hint slip to Eve. “Days of Our Lives” spoilers say Eve will pump Jack for more info on Monday. Once she realizes Jack’s sitting on a massive bomb, she’ll urge him to drop it on Melinda Trask (Laura Kai Chen). This could be exactly what Jack needs to score the position of mayor. However, getting ahead would be betraying JJ’s trust. Jack won’t think that’s a good idea, but Eve will do her best to talk him into it. She’ll note that it’ll work out well for JJ if Jack tells the truth. Eve may contend that JJ’s had enough legal troubles for a lifetime. Getting caught up in this would just bring more drama, so she’ll push Jack to protect his son. Jack’s guilt will rev up when JJ pays him a visit and reminds him to stay tight-lipped. He’ll be glad he can trust his dad, so that’ll just make Jack even more torn. Unfortunately, Eve will make sure this secret comes out no matter what! 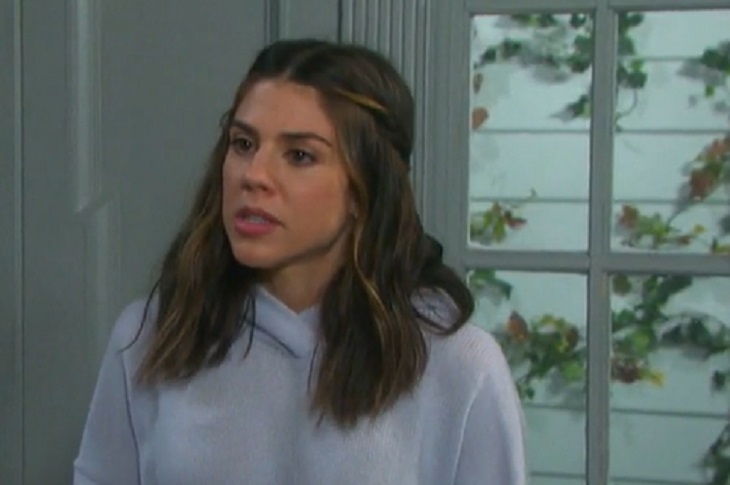 Over with Chad DiMera (Billy Flynn) and Abigail Deveraux (Kate Mansi), “Days of Our Lives” spoilers say they’ll come together over Charlotte Dimera. They’ll be desperate for her safe return. DOOL viewers can expect a tearful plea and a major reward. Abigail and Chad will be eager to see their daughter again and thankfully, they’ll get their wish soon enough. We’ll give you updates as other “Days” news and rumors emerge. Stick with the NBC soap and don’t forget to check SOS often for the latest “Days of Our Lives” spoilers, rumors, updates and news.